When it comes right down to it, guns, rifles and other personal firearms are only as good as the shooters holding them. And people are fallible creatures. We get itches, sometimes shakes, our eyesight can falter or our arms can get heavy. Any number of things can get in the way of a perfect shot, which makes shooting such a challenging sport. Or maybe that’s just old-school thinking. 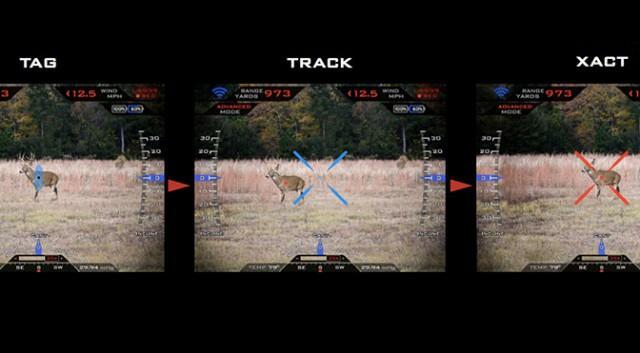 Tracking Point’s high-tech PGF, or precision-guided firearm, certainly ain’t your grandpappy’s shotgun. This rifle boasts some 21st century tech, with a laser range finder that lets you fix on a target over half a mile away. It even has an “idiot-proof” firing mechanism that’s somewhat similar to console games. The shooter presses a button to tag or lock on a target, and then squeezes and holds the trigger, which arms the gun. But the PGF won’t let you fire unless you’re aiming dead-on at the target. Only when the weapon’s aligned does the Xact System’s Networked Tracking Scope release the trigger. In other words, this is a gun that simply will not let you miss. The PGF features a ballistics computer with a Linux-powered scope, which offers a HUD overlay complete with data. The rifle automatically adjusts for different conditions, including range, temperature, barometric pressure, spin drift, wind input and inclination. There’s even a built-in Wi-Fi server, so the action can livestream, and pals can act as spotters, thanks to the Tracking Point iOS app and (included) iPad mini. The scope is also capable of recording footage for later playback. Naturally, some folks might be freaked about inexperienced shooters suddenly being able to blast phones out of people’s hands from half a mile away. That’s a pretty unnerving scenario, but the company took security seriously and made sure its PGF has password protection built in. Now, that doesn’t stop the rifle from firing, but at least the authentication ensures that it’s a strictly manual deal. Not just anyone will be able to pick up the rifle and suddenly have superhuman aim. The technology seems well-suited for military applications, but the company has said it wants to delve into the commercial market, i.e. hunters and target shooters. But is it really sportsman-like to use such a high-tech precision firearm? Well, we can mull that over, but the argument hasn’t stopped early adopters from getting their orders in. The first wave of TrackingPoint PGFs — which go for $17,000 to $22,000 — just shipped recently, and there’s a waiting list for additional supply. For a look at how the PGF works, check out the demo video from CES 2013. (That’s right — apparently with this, guns can now be considered a consumer electronic.) Then hit up the comments below and let us know if you are excited or concerned about such an advanced weapon being available in the open market.